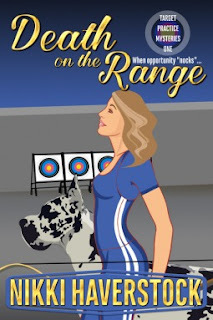 When a competitive archer is murdered at the training facility where Di has just started working, she's thrust into the middle of an unofficial investigation before she can even settle into her new life. With her roommate Mary and a Great Dane named Moo, she begins to unravel the mystery around the death of the victim, but can they solve the case before they find themselves in the killer's sights? A short, cosy murder mystery. Although the story is short at just over 100 pages, the characters are well developed and the mystery is intriguing; any longer and the story would have seemed dragged out. Death on the Range was full of humour and I particularly enjoyed Di's drunken retelling of the reasons why she filed for divorce, moved across the country and started a new job. She is an interesting, funny character and I will enjoy reading subsequent titles in the series.